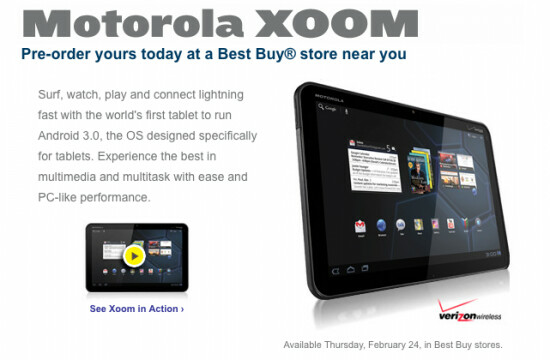 After a couple of false starts, it looks like Best Buy has put the Motorola XOOM on it's site to stay. The Honeycomb powered tablet is being offered with 3G for now but is upgradeable to 4G. The price of $799.99 is listed on the page, but any pre-orders must be done at a Best Buy store. What you can order online are the accessories for the tablet which includes a dock for the XOOM that costs $49.99. The dock offers a separate speaker for enhanced audio, and features an adapter plate and an AC wall power supply. Other extras include a $39.99 portfolio case and a Bluetooth wireless keyboard. This full-sized QWERTY, priced at $69.99 is powered by two AA batteries and will work on most of Motorola's Android offerings. The last accessory offered by Best Buy and available to be ordered online is the HD Speaker Dock for $129.99. With Noise-Canceling technology, sound is improved. The dock also allows your XOOM to make hands-free video chats with the Speakerphone mode. Of course, there is no sense in ordering the accessories online now unless you go into one of the big box stores and pre-order the Motorola XOOM in person. Anyone planning on spending their Sunday at Best Buy? If the storage is less than 64 gb it's overpriced. Other 3.0 tablets will be much cheaper. He'll even the 32 gb 3G iPad is cheaper. ...or just buy a netbook? Yes. For some people a netbook is better. For those of us who like our android devices and spend a lot of time browsing on them, this is a better alternative. Besides... netbooks don't have all the same apps as my phone and the widget comparison is laughable at best. 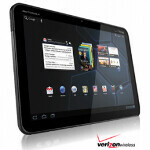 Please, if you don't like the motorola XOOM that's one thing but to say "or just buy a netbook ?" Is like telling someone with an iPod to just buy an external hard drive and plug headphones into their computer. So which is cheaper...paying $499+ for current 3G tablet and then rebuying whatever the 4G model at at least the same price or paying for the a $799 Xoom that's 3G now and upgraded for free to 4G? Seems like Motorola is thinking more about the future rather just now which to me is a smart idea. So that leaves the other manufacturers to either wait and produce a 4G model around the same price or follow Motorola's lead to be competitive to that deal. Of course why buy a tablet when netbooks are cheaper but to be honest why buy a netbook when there are notebooks that a similarly priced plus a lot more efficient? netbooks are ok but not a big enough diff. to not just get a real laptop. Tablets are just a much more appealing option. I'm not one that has a need for a tablet but if i were to want a device outside of my laptop and its between a netbook and a tablet i would pay extra to get a tablet. Even though Jeff is usually pretty negative whenever he posts :)... I do agree with him. I like my android device, but why have a tablet that does the same thing when I can have a netbook with even more memory and does what I need to browse online. Even though this tab is extremely nice, it's not even worth paying that much for. Opinions vary though, anyone who will get one I'm sure will make good use out of it. I just need a netbook with built in 3g and I'll be fine for whenever I go over to the parents, who have no internet.